There’s been an awful lot of Korean stuff going on this year. In the UK, All Eyes on Korea, Korea putting up a good showing in the Olympics, Im Kwon Taek in town, Lee Byung hun and BIGBANG coming soon, a huge art show at the Saatchi… and everywhere you turn there’s a certain rapper in the news and everyone’s doing the horse dance. A question that people are consequently beginning to ask, particularly in Korea, is whether Korean culture has, in some way, “made it” internationally. And in the past week I’ve been asked for input into two topics which are to be the subject of articles or talks in Korea in the near future: specifically whether Korean visual arts have now got established in London, and on whether K-culture is having a “global effect”. I must say that while I’m delighted to be kept so busy by all the cultural events here I’m not sure that I can answer both questions in the affirmative. Both both are interesting and require serious thought – and probably armies of officials in the Ministry of Culture Sports and Tourism are trying to answer those and similar questions. I’ll try to think and write about both topics, but with all the film going on right now it’s probably not going to be any time soon. But just as an indication of where I’m coming from, at the top of this page is a photo of two pages from the Financial Times recently. 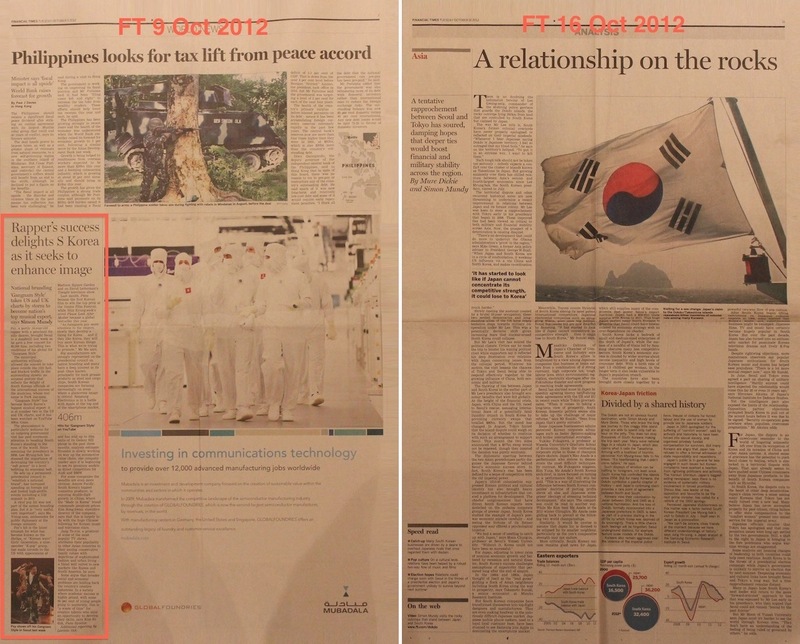 On 9 October, quite unusually, the FT devoted an unprecedented 24 column inches (excluding headline) on PSY, national branding and related topics. But exactly a week later a whole page was devoted to the impact of worsening relations with Japan over a some rocky Korean islands in the East Sea.